VOL. 54 ISSUE 46 NOVEMBER 21, 2017 P33 Area KTM 300 XC. "I knew I was out of shape so I stood up and people kept wrecking in front of me, honestly, so I eventually got in the lead. I didn't want to be there so I dropped back and let a couple guys by me. They were battling pretty hard and I could just key off their lines, save en- ergy. The last lap I just put it all out so I didn't get caught." Hart finished in two hours, 53 minutes and 58 seconds, with Bolin taking second in 2:55:11. Having secured the FMF Pro 250 Championship at the previ- ous round, Baker entered the Pro class this time and gave a good accounting, still aboard the IMS/Shorai/Sidi 250 XC he'd won the championship with. One of the early leaders, he earned third overall in 2:57:29 with Ger- ston fourth and the last rider to finish under three hours with his 2:59:30. "I would've liked to have won it and I probably could've, but I was trying to be smart and I just wanted to get through it," Gerston said. "I'm not going to play the coulda, woulda, shoulda game. I had a blast; I was re- ally enjoying myself, and I just wanted to make sure me and my bike and everything got the fin- ish line in one big, nice piece so I can put a big number-one plate on my bike and drive home and be able to sleep tonight." 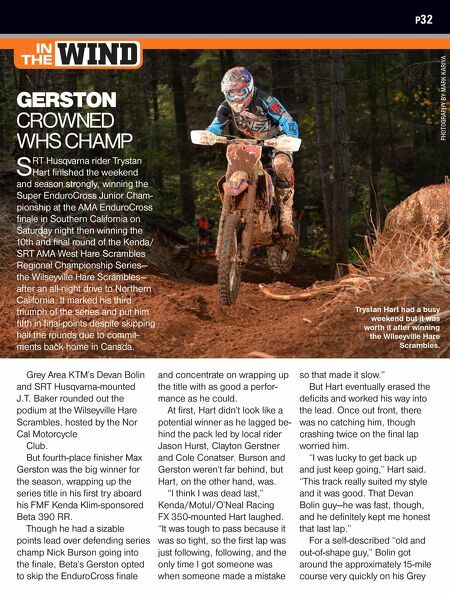 SRT KTM's Steven Godman, FMF Pro 250 winner Patrick Garrahan, EMT Racing KTM's Conatser (who'd clinched second FMF Pro 250 last month), GasGas rider Joey Fiasconaro, Purvines DA8 Racing Yamaha's Axel Pearson and FMF Pro 250 runner-up Dillon Sheppard rounded out the top 10 overall. Defending series champ Nick Burson ended up 12th overall, the Purvines DA8 Racing Yamaha rider slowed after Godman bounced off his front brake in a banzai pass at a bottleneck, requir- ing a pit stop to replace the system. Mark Kariya AA: 1. 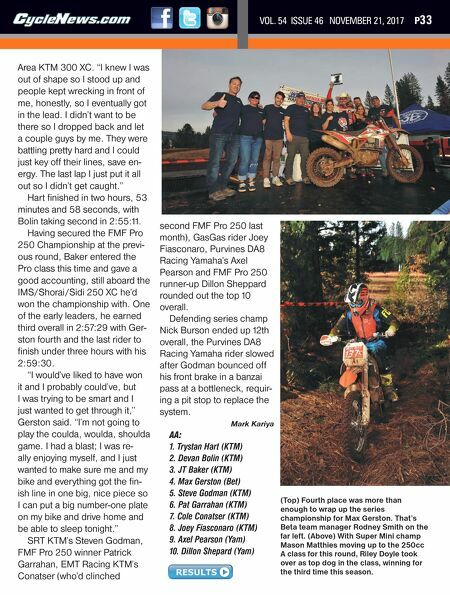 Trystan Hart (KTM) 2. Devan Bolin (KTM) 3. JT Baker (KTM) 4. Max Gerston (Bet) 5. Steve Godman (KTM) 6. Pat Garrahan (KTM) 7. Cole Conatser (KTM) 8. Joey Fiasconaro (KTM) 9. Axel Pearson (Yam) 10. Dillon Shepard (Yam) (Top) Fourth place was more than enough to wrap up the series championship for Max Gerston. That's Beta team manager Rodney Smith on the far left. (Above) With Super Mini champ Mason Matthies moving up to the 250cc A class for this round, Riley Doyle took over as top dog in the class, winning for the third time this season.